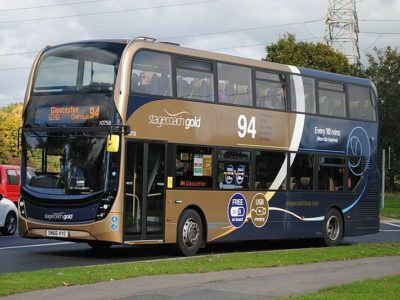 Sapphire exterior livery - classic Stenning. Sapphire's PA system detailing money-back guarantee. Something shiny is about to hit the UK’s streets. 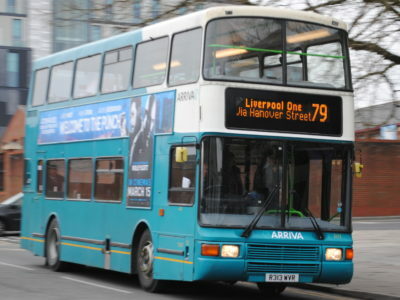 Arriva UK will roll out its answer to Stagecoach’s Gold and First’s, ahem, “Gold service“ concepts from April 2013 in Chester, followed by further launches in the Midlands, Oxfordshire and the North East. 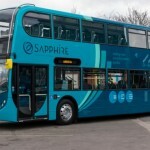 You could be forgiven for thinking that Sapphire is a little short of a revolution for the UK bus market. 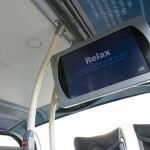 After all, wifi, leather seats, a bit of chrome and passenger announcement systems aren’t a new phenomenon, are they? Well no…no, they’re not actually. 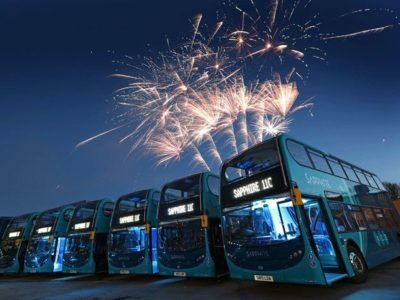 Sapphire’s introduction does however mark a new brand proposition for Arriva. It signals a commitment from the company to finally try to offer something which might actually present a mildly attractive alternative to the car. 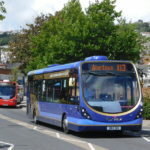 It hopes that direct routes, a customer charter with a Trent Barton-esque money-back guarantee, and vehicles with some added wow-factor might finally be enough to win valuable custom on those interurban routes. 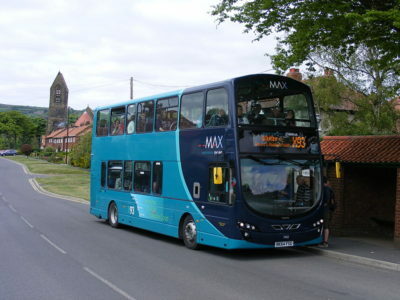 The vehicles themselves aren’t actually new either (although the Durham vehicles will be). 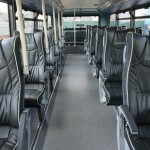 The majority will be refurbished Enviro 400s, albeit refurbished to an extremely high standard, as the pictures here show. 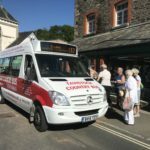 The Sapphire livery and design is classic Stenning, from the swooping clean lines to the brand name, elegantly picked out in chrome on the exterior. The concept is much more than just a shiny new facade though. 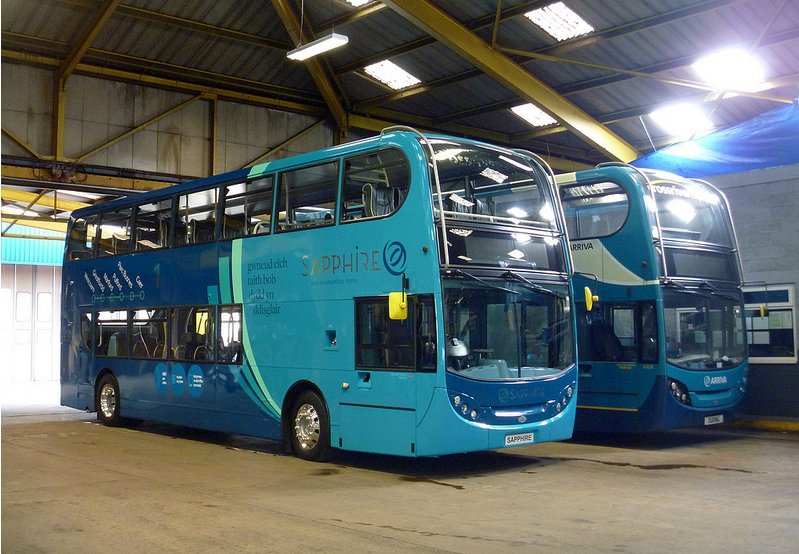 Sapphire aims to create a sense of safety, space, reliability, punctuality and professionalism – attributes which customers in 2013 are beginning to expect rather than savour. 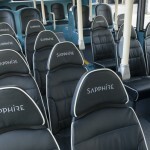 Whether or not Sapphire will achieve the holy grail of converting car users to bus passengers remains to be seen. 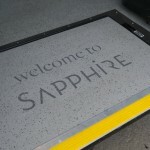 If Sapphire came to your local A-road, would you be tempted? 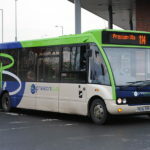 Tweet us; @transportdsn or share your thoughts below. Featured image by kilmara on Flickr.